Aged recycled forest products, composted dairy manure, composted poultry manure, dehydrated poultry manure, hydrolyzed feather meal. 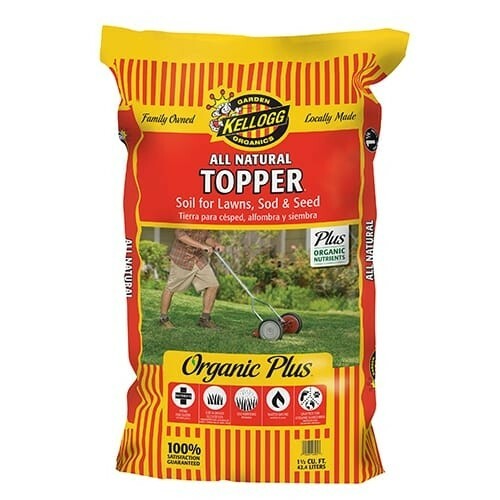 Topper is the perfect topdressing and soil amendment for your lawn. If you’re laying down sod, seeding a new lawn, or over seeding your lawn, you can trust Topper to deliver a greener, more dense turf. Topper is enriched with a starter fertilizer to help new lawns get off to a good start and improve existing lawns with a nice boost. Helps with moisture retention so water will drain deep into the soil to encourage deep root growth. This promotes a strong healthy lawn which can lead to less weeds and pests. Pets and children can walk and play on your lawn as this product does not contain in harmful chemicals.